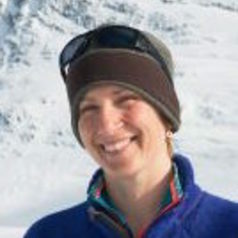 Dr. Kristin Laidre is a Principal Scientist at the Polar Science Center, Applied Physics Laboratory, University of Washington working on problems of applied animal ecology in the Arctic. She is an Associate Professor at the School of Aquatic and Fishery Sciences and is partially supported by the Greenland Institute of Natural Resources in Nuuk, Greenland. She was named a Pew Marine Conservation fellow in 2017. Kristin’s research is focused on broad questions about Arctic marine mammals. Her research is field-based, largely empirical, and focuses on using quantitative data on individual movements, foraging behavior, and life history to unite behavioral, population, and evolutionary ecology. She is particularly interested in linking individual performance to an animal’s selection for habitat resources and predicting how these relationships will be impacted by climate change. Her interests include wildlife conservation and management, scaling questions in ecology, and the application of Geographic Information Systems to spatial data. She is a member of the IUCN Species Survival Commission Cetacean Specialist Group and the IUCN Polar Bear Specialist Group. She has participated in over 40 field expeditions in Greenland and authored or co-authored over 100 peer-reviewed scientific articles and 3 books on high-latitude marine mammals. Kristin is broadly involved in science communication outside of the university, including local high schools, elementary schools, museums, and community centers. She also takes creative approaches to science communication and outreach, partners with artists. Her research has been featured multiple times in National Geographic, the New York Times, National Public Radio, Washington Post, BBC, New Scientist, Smithsonian Magazine, National Wildlife Magazine, the Sunday Telegraph, Reuters, Good Morning America, CBS, NBC, and many other international media outlets.